Nothing says Spring like the sweet taste of asparagus! 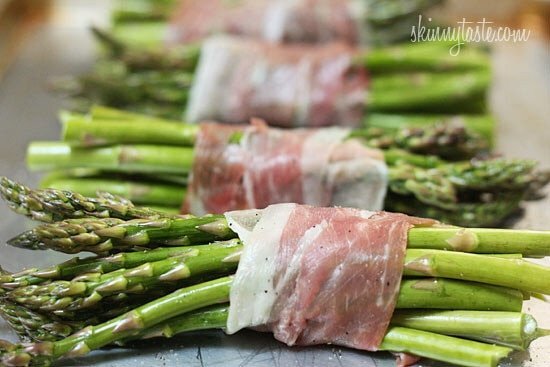 Roasted prosciutto wrapped asparagus bundles that is, for a simple yet elegant side dish, perfect for Easter. These bundles are the perfect side to any dinner party. Some main dish pairings might be a Roasted Boneless Leg of Lamb, Apricot Rum Glazed Spiral Ham, or a Baked Salmon. I got this idea from Rachel Ray only her version was with bacon. Prosciutto is a little fancier and I loved how the flavors combined. I enjoyed a bundle with a poached egg for lunch and it was divine, great for brunch! You can easily double or triple this and assemble them ahead. Can you make them without the prosciutto? … sure! Just sprinkle with a little salt and lay them flat on the baking sheet, you can use the same cooking time. Lightly spritz asparagus spears with extra virgin oil. Season with fresh cracked pepper and divide into 4 bundles. 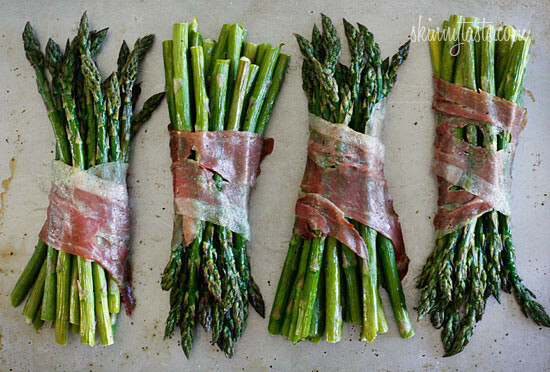 Gather 1/4 of the asparagus and use a slice of prosciutto to wrap each bundle and place on a baking dish seam side down. Repeat with remaining, place on baking dish and bake 12 minutes or until asparagus is tender crisp. Can I use frozen asparagus? I have a huge bunch in my fridge but will have to freeze some before it spoils…. Thanks for the idea! My boyfriend actually ate his vegetables, and said, "If my mom served asparagus like this growing up, I would've liked it better." I usually buy my veggies frozen as I don't go to the store that often. Would this work with frozen asparagus? I have been making these for a few years now. I use about 6-8 asparagus and wrap with prosciutto, drizzle olive oil, then sprinkle with Grillmates seasoning (our favorite is the Seafood seasoning). Put on the grill …yum! 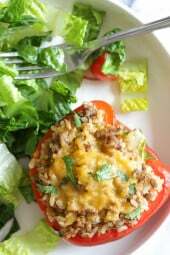 Serve with grilled corn on the cob and chicken, and you have a meal! These were fabulous! 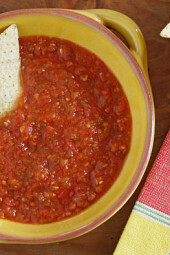 Made them with Gina's grilled chicken bruschetta – perfect combo! These were delicious! I will be making this over and over. 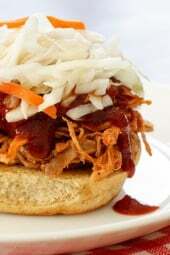 I made this recipe today as a side dish to go with our baked ham. I didn't have prosciutto but used turkey bacon instead. And also made your Rosemary Garlic Parmesan biscuits, both recipes were delicious!!! You can also spread a bit of neufchatel (or light cream cheese) on the prosciutto before wrapping it. One of my favorite side dishes. Went and got the ingredients to make this last night! Question though, does the prosciutto get crispy? Thanks so much for the great recipes!! Made this tonight as a side dish to chicken and it was awesome! Will be making this again for Easter as it looks very impressive when you plate it. Thanks! I've been making these for a few years, love them! Works great on the grill also but I precook the asparagus about 1/2 done first so the proscuitto does not burn on the grill before the asparagus is cooked. Also add a touch of balsamic and finely chopped garlic.. Delish! Gorgeous photos. One of my favorite ways to eat this lovely spring green. Got this from Giada, I use olive oil with fresh squeezed lemon. Yum. My new favorite. This will be the new way I fix asparagus. So easy and quick!!! Yum! I made this for my sister's bridal shower. We soaked it in olive oil, balsamic vinegar, and garlic. It was AMAZING. Have to ask- how do you eat this? Do you unwrap it? You just gave me the perfect idea for Easter Sunday side dish. Thank you! Asparagus is one of the only veggies my son will eat. We make it on the grill all summer long. This is a great alternatitive. Will have to try it this weekend! Thanks! Wrap prosciutto with anything & its good! My husband doesn't eat red meat, but I'm thinking of trying this using D'Artagnan's "Duck Prosciutto" to accompany the duck I plan to roast for our Easter dinner. I also wanted to know if you can use turkey bacon as well. I have both asparagus and turkey bacon at home and don't want to make an extra trip to the grocery store. As always I love your site!!! Can i use turkey bacon instead of the prosciutto? That's what I'm trying tonight, hopefully it turns out well! Love this dish! I've made a version of it where you spread a very thin layer of some light garlic and herb boursin cheese on the proscuitto before wrapping it around the asparagus. Delicious! I've also served it cold – blanche the asparagus and shock in ice water, dry off and then wrap with the boursin and proscuitto. One of my favorite side dishes. I made it one time, went out to my grill to grab my meat, came back in the kitchen only to find my dog at all of my prosciutto wraps. Now this dog is a good dog, never touches food, doesn't beg so I trusted her. I guess this is her favorite side dish to. You read my mind! 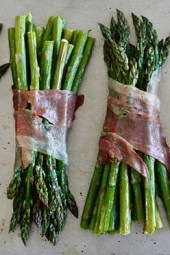 I have fresh asparagus and prosciutto in my fridge as I type! I sprinkle with a little parmesan if I can afford the extra calories. I am hankering for your asparagus and poached egg recipe that you posted last year. That was a little bit of heaven! Yes! Try it with this, so good! We added a little shaved gruyere cheese to the top of mine. Yum!!! Awww my gawd..I think I almost died when I saw these! I LOVE sweets and sugar..but I could eat asparagus like its candy. Im obsessed. These.look.AMAZING! I can't wait to try this! YUMMM! I've made phyllo wrapped asparagus before and it was delicious. Adding some prosciutto? Brilliant. Delicious. I cannot wait to have a spring garden party and make these. I just made asparagus soup last night, but saved a little…and I'm glad I did. This will be fun to make for friends. 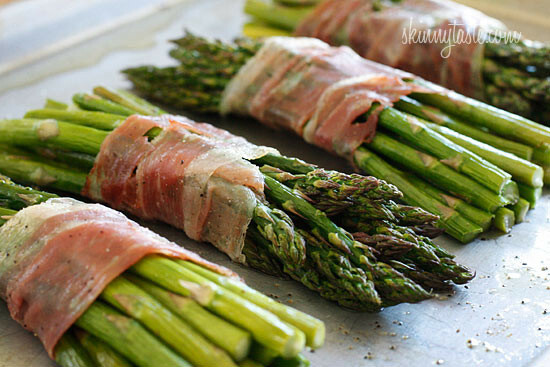 One of my fav ways to enjoy asparagus! Sounds yummy! Thank for all your great recipes — thanks to you and your great recipes, I have lost 51.2 pounds! Lollie that is amazing!! Keep up the great work. This gives me the inspiration to finally tackle my 25 pounds I need to get rid of asap. Thank you. Yes, I must eat this…soon. A classic pairing!